Most nineteen eighties amplifiers weren’t much to write home about, especially the gadget festooned behemoths. 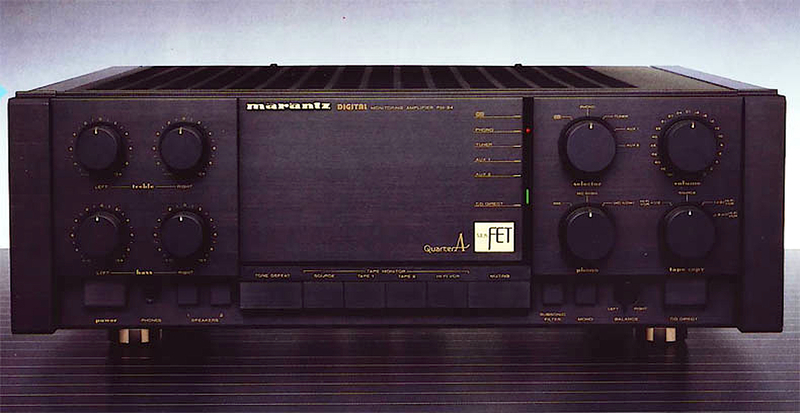 But Marantz’s flagship was special – a chunky 25kg integrated which sold for £1,000, it boasted the company’s unusual ‘Quarter-A’ system, in which lower level signals up to a quarter of the maximum power output were handled in pure Class A. But when called upon to pump higher levels, the amp switched into Class AB, resulting in a not inconsiderable 140W RMS per channel – the system was surprisingly effective in practice. Following designer Ken Ishiwata’s traditional practice, it employed carefully specified, high-grade componentry. For example, critical signal capacitors were damped copper styrol types, while the main power caps were damped with ceramic powder to eliminate microphony. To reduce sound-degrading eddy currents, the chassis was all copper, along with most of the power transistor and case screws. And just for good measure the transformer was a huge centrally mounted toroid. Finally, rather than just chucking in a proprietary IC phono stage or even doing a quick discrete transistor jobbie, Marantz specified a superb quality LC-OFC wound transformer. So rather than being a steroidally enhanced version of your average gadget festooned Jap amp, the ’94 was a finely fettled design indeed. Providing the Source Direct mode was used to bypass its numerous unnecessary bells and whistles, it sounded gorgeous. At normal listening levels it was an extremely sweet, clean, clear performer with an uncanny ability to let music flood forth from your speakers. But pressed into action with a clockwise twist of its beercan-sized volume control, the velvet fist turned into an iron battering ram able to make mincemeat of the most inefficient loudspeakers. Such superb engineering means all the PM-94s that found their way into the UK should still be running sweet as a nut even today. And if you factor Marantz’s excellent after sales service into the equation, there’s a lot to be said for acquiring a used machine. Unfortunately, the amp is already something of a cult, meaning it isn’t as cheap as most of its rivals of a similar vintage – look to pay up to £400 for a top example. Cheap even at this price, it is one hell of a classic amplifier.